The Balti Half Marathon races will run for 21 km 0975 m, 10,5 km and Fun Run 2 km. The start and finish of the races will take place at Vasile Alexandri Square, Independentii str. 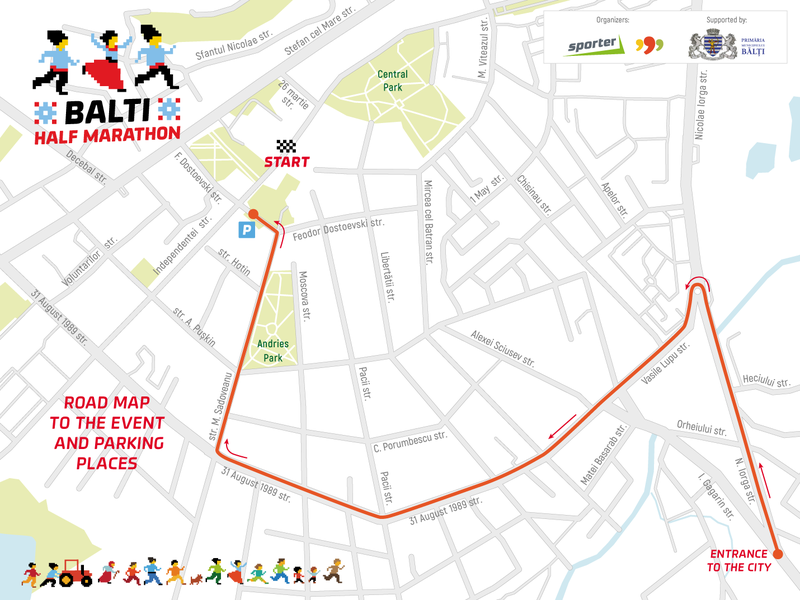 The half marathon route (21 km 0975 m) will take the following route: Alexandri Square – Stefan cel Mare str. – Alexandri Square. The total length of the route is 21.097 km. A half-marathon participant must run 2 rounds of the route. The time limit is 3 hours. The race track for 10,5 km will take the following route: Alexandri Square – Stefan cel Mare str. – Alexandri Square. The total length of the route is 10.5 km. A 10.5 km runner must run 1 round of the route. The time limit is 1.5 hours. The Fun Run (2 km) runs along the following route: Alexandri Square – Central Park – Viteazul str. – Alexandri Square. The total length of the route is 2 km. Hey runner, wait a minute! It does not matter, you’re running 1,5 km or 21 kilometers, Balti Half-Marathon will take place just for you!